Summertime means sunshine, blue skies and hot weather, right? Wrong! Unfortunately, summer often means day after day of rain, followed by a light drizzle and even more rain. You might not mind the weather so much, but when the kids are feeling stir-crazy sitting in the house day after day, it’s time to take action. Little ones: You need long pieces of string or yarn for this one. String a piece from one room to the other, going up a set of stairs if you want. At the end of the string will be a small “treasure” such as a whistle or sweet. Another string will follow, with a treasure at the end. And so on, until they get to the end. Use as many pieces of string as you have room for, but tell the kids beforehand that each child is allowed only a specific number of prizes (make sure there are enough for each child to have an even number). The final string can direct the children back to the kitchen, where a snack awaits. Older kids: Children who can already read can follow written clues to discover treasure along the way. Break into groups of two, and give each group a written clue, such as “A shower a day keeps the dirt away.” When they get to the shower, they find another written clue. Make the clues different for each group, so there is no overlap and therefore no disappointment. At the end, they find a prize. Think of as many clues as you want, depending on their interest and attention span. Children up to age 10 or 11 love making puppet shows. Break out all the puppets in your home, or make your own sock puppets by drawing or sewing faces on the palm. You can also make puppets using simple drinking straws, by gluing small faces/animals on the top. Once the puppets are assembled, have the children think of a loose theme, then let them improvise. A planned production can include ticket-making, serving snacks during the interval, and writing up a programme. Great for an afternoon of fun. Showcase your children’s talents this summer by staging a talent show in your living room. Invite their friends around and have a small competition as they sing, dance, play the harmonica, or just tell a silly joke. Make sure everyone wins a prize, even if it’s just for “Loudest Act”, so nobody feels left out. Nothin’ says lovin’ like something from the oven. And what better time to make the house smell all spicy and delicious than when it’s raining outside? Make biscuits, a cake, or even a full meal, if the children are older. For very little ones, decorating fairy cakes is ideal. Saving up old magazines, newspapers and circulars for a rainy day is a fantastic idea. Hide them from the kids, then give each one a stack, along with a pair of scissors, a large piece of paper and a gluestick. You can theme your collage if you want, or let them make whatever they want. The while idea is just to be creative and have fun! Throw all your kids swimming gear into one box, including swimming costumes, water wings, beach umbrellas, sunhats, beach toys – the whole kit and caboodle. Grab a blue blanket or towel to make the “sea” and throw a few bath toys (starfish, mermaids) on top. You can even enjoy a picnic on the beach, without the sand. Kids love the cinema, and if you have popcorn there’s no reason why they can’t enjoy one at home. To create a real atmosphere, close all your curtains to make your living room as dark as possible. If you know in advance that the weather will be bad, it might be a good idea to rent a DVD (and buy some popcorn) beforehand that your children haven’t yet seen. What about a sleepover party - in the day? Girls in particular love this activity. Invite some friends over and have them bring their pyjamas, a pillow and at least one cuddly toy – sleeping bags optional. Dim the lights, line up some blankets, and pretend it’s night-time. Don’t forget the midnight feast! 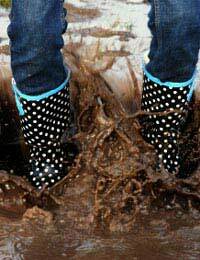 Peppa Pig loves muddy puddles; most children do too. So let the kids get as dirty and messy as they want – just this once. Dress everyone up in macs and wellies and enjoy the mud, making sure all mucky clothes are taken off before they re-enter the house. A hot bath and a cup of hot chocolate afterwards makes for a great afternoon. Thank you for this article which has some great ideas. With three children and the summer holidays approaching, I am always looking for suggestions. A few weeks ago we were in Bath for the weekend with friends (and their children) and on Sunday it absolutely poured down. My husband did treasure hunts to keep everyone amused and they were great, but they ran out of steam in the end. Anyway, to make sure I have got an emergency bad weather plan for the summer holiday, I have bought a load of bags, aprons and t-shirts from a company called The Clever Baggers with a batch of fabric paints and stick on craft. I am hoping this will provide fun on a rainy day, if needed. If not, one of our daughters has a birthday in August and I will use this craft activity for the party. Thank you again for the article and I look forward to reading more of your ideas soon.